A Historic Landmark is a building, site, structure, object, or district, that is officially recognized by the United States government for its historical significance. 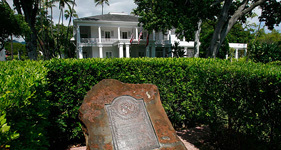 All Historic Landmarks are listed in the National Register of Historic Places. There are hundreds of bed and breakfast and inns identified by the National Trust for Historic Preservation that have faithfully maintained their historic architecture and ambiance. To be selected for this program, a hotel must be at least 50 years old, listed in or eligible for the National Register of Historic Places or recognized locally as having historic significance. These historic hotel landmarks represent the heritage and development of America. Bed and breakfasts are situated in settings that range from rustic to refined, in locales as diverse as the mountain wilderness, manicured country sides, the center of small towns and bustling metropolises. Morris House Hotel B&B - Philadelphia, PA – This registered national historic landmark has been renovated into a luxury boutique hotel in Philadelphia, which offers the coziness of a bed and breakfast, in an 18th century setting, combined with the luxuries of today. Each of the fifteen rooms is decorated with individual charm and remarkable attention to detail. 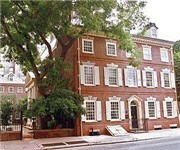 The Morris House, built in 1787, is located in the historic district of Philadelphia known as Society Hill, just two blocks from some of our nation's most important landmarks such as Independence Hall and the Liberty Bell. The Anniversary Inn South Temple - Salt Lake City, UT – At the Anniversary Inn each suite is furnished with extraordinary attention to detail. Well appointed King and Queen-size beds, large jetted tubs, and large screen TVs make our rooms the best place to rest, relax, and enjoy time away from the cares of the world. Guests will enjoy complimentary cheesecake and sparkling cider upon check in, as well as a freshly baked breakfast delivered directly to their room in the morning. The Anniversary Inn South Temple location sits in the historical Avenues section of Salt Lake City on South Temple and 7th East. The Victorian-style mansion was built in 1889 by Emmanuel Kahn and is on the National Historic Registry. It retains all of its charm and many of its original features. Ashley Manor - Barnstable, MA – For your Cape Cod vacation, come to Ashley Manor Bed and Breakfast and discover a very special place, ideally located in the heart of Cape Cod’s historic district, just minutes from the Historic Village of Barnstable and Barnstable Harbor. This circa,1699, New England Bed and Breakfast Inn, reflects the elegance and romance of an all-but-forgotten way of life. Beautifully restored, Ashley Manor quietly blends the amenities of your comfort expectations with the grace and dignity of an earlier time. This award winning bed and breakfast is close to many of Cape Cod’s attractions including island ferries, some of the Cape’s finest restaurants, beaches, shops, galleries and nature trails. Originally built in 1699, Ashley Manor has seen many additions over the centuries. Evidence of its age and history can be seen in the wide board flooring, wood usually reserved for the king during colonial times. Taylor House Inn - Banner Elk, NC – Guarded by some of the highest peaks of southern Appalachian, the Valle Crucis stretch of Watauga River Valley retains an air of simplicity lost to most places generations ago. This lovely old farmhouse was built for the C.D. "Squire" Taylor family in 1911. It received extensive renovations in 1987 and is now home to hundreds of travelers. It has been entered into The National Register of Historic Places. Summit Inn Bed & Breakfast - Center City, MN – High above the sparkling waters of Ki-chi-saga (North Center Lake) sits the Summit Inn, a unique combination of tranquility and history. Once the home of lawyers and physicians, (in a community immortalized through the epic works Vilhelm Moberg, creator of the mythical Swedish immigrants, Karl Oskar and Kristina) the Summit Inn is listed on the National Register of Historic Places. Built in 1904, this Victorian-style inn features an English cottage garden with meandering limestone paths and a goldfish pond with a fountain. Amsterdam Castle - Amsterdam, NY – Built in 1894 by the state of New York for the National Guard, Amsterdam Castle is a 36,000 square foot private residence listed on the National Register of Historic Places New York originally built 100 of these armories, of which nearly 50 are still in use by the National Guard. Other “sister” armories uses include a military museum (Saratoga), art gallery (Manhattan East Side), and a concert hall (Albany). This armory was decommissioned in 1995 and is the only armory converted into a home. This historic building was built in 1894 for the National Guard by the State of New York. Restored as a private residence, this 50-room facility features four turrets, three living quarters, reception rooms, a terrace and a 10,000-square-foot ballroom with soaring oak ceilings and a basketball gym. Dreamhouse Country Inn - Bristol, VT – Dreamhouse Country Inn where good food, luxurious comfort and gracious hospitality combine to make your visit the best it can be. We want every detail of your stay to make you feel special and at home. Our rooms are spacious; our breakfasts naturally delicious and our rates are very affordable. Dreamhouse Country Inn is on the Historic Register for the State of Vermont. Built in 1852, it is known as one of the finest examples of Gothic Cottage architecture in Vermont. Nestled in the middle of 6.5 acres of pastoral beauty, it is surrounded by perennial gardens, maple groves, an apple orchard, berry bushes and a rambling old stone wall. Chinaberry Hill 1889 Grand Victorian Inn and Cottage - Tacoma, WA – Perched on a hill overlooking Puget Sound, this 1889 Grand Victorian Inn is on the National Historical Register and has been featured in Tacoma's Grand Home Tours. 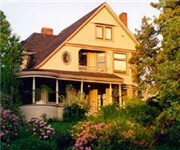 This 1889 Grand Victorian Tacoma bed and breakfast is one of the top rated bed and breakfasts in the Seattle Washington Pacific Northwest area. 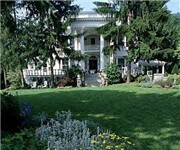 The Pacific Northwest is known for its hospitality and Chinaberry Hill Bed and Breakfast is certainly no exception. With boutique hotel accommodations and first class bed & breakfast amenities, luxurious beds and wonderful breakfasts in Tacoma Washington, Chinaberry Hill offers the best in Seattle Tacoma bed and breakfast lodging and hospitality. 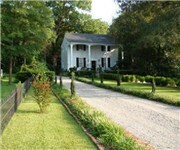 Stonehurst Place - Atlanta, GA – Stonehurst Place, a romantic bed and breakfast inn offering the finest accommodation experience in Atlanta. We are small enough to give the personal attention you seek, and provide exceptional hospitality and a commitment to service in the tradition of First Class hotels and inns worldwide. Built in 1896, our National Historic Register home, the “Hinman House”, was extensively renovated and lovingly restored in 2008. This historic preservation, which used EarthCraft House™ standards (like those of LEED), provides an alternative to Atlanta hotels in the form of a unique, eco-friendly and personal setting for business and leisure travelers visiting Downtown and Midtown Atlanta. Stonehurst Place has become a destination for travelers and a landmark in Midtown for its utilization of “green lodging” initiatives such as water reclamation, purification, recycling, reuse, and solar energy. Beaufort House Inn - Asheville, NC – Enjoy the warmth and friendly atmosphere of a one-of-a-kind historic property. Built in 1894, this historic home has been meticulously restored as a romantic bed and breakfast inn with an air of casual luxury and elegance - the perfect environment for an exceptional getaway experience. Listed on the National Register of Historic Places, this beautiful Queen Anne Victorian is situated on 1 ½ acres set back off the road in the quiet, residential neighborhood of the Chestnut Historic District. It provides an oasis of beautifully landscaped grounds, gardens, and waterfalls just a half mile stroll from the vibrant activities of downtown Asheville, NC. It's as convenient as it was when actor Charlton Heston and his wife, Lydia, made The Beaufort House their Asheville residence, and walked to their theater downtown (which is still there and putting on great plays throughout the year). Albemarle Inn - Asheville, NC – The Albemarle Inn, a magnificently restored 1907 Greek Revival mansion, tops every list of Asheville, North Carolina inns. Located in park-like grounds in the famed Grove Park district, the Asheville bed and breakfast offers ten elegant rooms and a spacious two-room suite with an enclosed sun porch. On the National Register of Historic Places, the inn once hosted the renowned composer, Bela Bartok. As an Asheville bed & breakfast holding the coveted AAA Four-Diamond rating, the Albemarle Inn ranks with the world-famous Grove Park Inn and the Inn on Biltmore Estate for quality, service, and hospitality. Each room pampers guests in the luxurious comfort of period furnishings, fine linens, goosedown quilts, and a private bath with a clawfoot tub and shower combination. Stone Ridge Farm - Dublin, PA – Located on a 10-acre horse farm, The Inn is located close to all major attractions: New Hope/Lambertville, Doylestown (The National Geographic's (June 2000) Guide to Small Town Escapes rates Doylestown as one of the nation's top places to visit for a weekend escape. Doylestown is also listed in the top Dozen Destinations of Distinction by the National Trust for Historic Preservation), Peddler's Village, and between Peace Valley Park and Lake Nockamixon State Park, offering canoeing, kayaking, sailing, horseback riding, hiking and biking trails for outdoor enthusiasts. Stone Ridge Farm Country Inn has been voted one of the Top 15 B&B's for "The Best for Rest and Relaxation in the Northeast" by inngoers in Arrington's Bed & Breakfast Journal's 2004 Book of Lists! Make your reservation today for a wonderful romantic stay of rest and relaxation at the awesome Stone Ridge Farm Country Inn Bed and Breakfast in beautiful Bucks County. Fairview Inn Bed & Breakfast - Valdosta, GA – Fairview Inn is located in the heart of Valdosta’s oldest residential neighborhood, and immediately takes you back to the late 1800’s when southern comfort and hospitality were a way of life. Valdosta’s oldest house can be found in our neighborhood as well as many other proudly restored homes. Fairview neighborhood also takes great pride in being listed on the National Historic Register. King-Keith House B&B - Atlanta, GA – Located in a National Register of Historic Places neighborhood, the spectacular Queen-Anne-style King-Keith House is one of the most photographed houses in Atlanta, Georgia in addition to being a premier Atlanta Historic Bed and Breakfast. It was built in 1890 by the local hardware magnate. Old house enthusiasts, choosing to stay at our bed and breakfast, will enjoy the varied architecture of the restored neighborhood, Inman Park, shaded by live oaks and including such homes as the residence of the founder of Coca-Cola. The King-Keith House was built circa 1890 by George E. King, the local hardware magnate and owner of Atlanta's King Hardware. He and his large family, including six daughters, lived in Inman Park during it's prime. Heron Haus Bed & Breakfast Inn - Portland, OR – Heron Haus is a 10,000 square foot English Tudor home designed by noted Portland architect Joseph Jacobberger in 1904. The home's fine craftsmanship lends it a beautiful but casual elegance. Heron Haus is listed on the National Historic Registry. Tartan Thistle Bed and Breakfast - McKinney, TX – Tartan Thistle B&B occupies the L. A. Scott home in historic McKinney, Texas. The house is listed in the National Register of Historic Places and is a Texas Historic Landmark. The original 1880's Victorian home was expanded and remodeled by Louis and Louise Scott at the turn of the century and includes ample areas for guests to relax on the wide veranda and second floor front porch. The home has been restored with modern conveniences while maintaining its authentic Neo-Classical Victorian architecture. McCall House Bed & Breakfast - Ashland, OR – 1883 Victorian on National Register, recently restored, just one block from Shakespeare theatres and downtown Plaza. For more information on Historic Hotels of America and the National Trust for Historic Preservation click here.